This specialized text presents a review of general biochemistry and an in-depth exploration of biochemistry unique to the eye. As a readable introduction to this challenging topic, it describes the molecular structures and biochemical events that occur in the eye. Specific clinical examples link basic science to clinical practice and provide a concrete basis for understanding complex concepts. This edition includes new, updated information in revised chapters plus two additional chapters on ocular fluids and pathology. General biochemistry is discussed in each chapter, with examples of biochemical pathology and disease processes such as age-related cataract formation and ocular diabetes. Well-illustrated content, featuring color inserts with 10 illustrations, shows visual aspects of biochemistry. 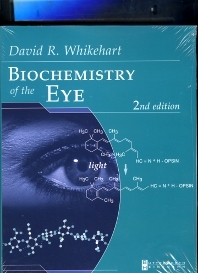 Each chapter features a general review of the subject matter prior to discussing ocular biochemistry. Discussions of proteins that are either unique to the eye and/or have special functions in the eye, such as collagen's role in the structure of the cornea, emphasize the importance of these compounds and their many essential cellular and ocular functions. Discussions of the nature and function of enzymes, in addition to descriptions of examples of specific enzymes found in the eye, highlight the manner in which many biochemical reactions occur in the eye is via enzyme catalysis. A chapter on carbohydrates emphasizes the importance of the two roles of carbohydrates in ocular tissue: energy supply (nutrition) and as a source of extracellular structure. An explanation of the many different kinds of lipids that exist in the eye features the most up-to-date material on tear film lipids and useful information on dietary Vitamin A requirements. A chapter on hormones deals with the role of hormones in general and shows how hormones play roles in ocular functions, including the process of visual transduction as a hormonal function. A thorough review of nucleic acid chemistry points out its role in molecular biological functions such as DNA replication, RNA transcription, and protein translation, as well as DNA mutations. A chapter on neurochemistry provides an understanding of basic neurochemistry and how neurochemistry can explain the complex functions of the retina. The immunochemistry chapter contains basic material on biochemical and cellular immunology, discussing immune privilege in the eye and the importance of immune reactions at the anterior segment.